Vision Statement: The Normandale Japanese Garden (Nihon Teien) is an authentic traditional Japanese Garden in North America that provides a special experience to each and every visitor; a Garden open year round to the community; a place where the unique skills and techniques that are necessary to create a Japanese garden are observed, cherished, learned; where specialized interpretation of cultural traditions and elements of the Nihon Teien ensure the continuance for many generations in the future. 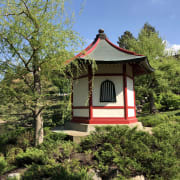 The Normandale Japanese Garden Committee is a 10-20 person advisory committee. The Committee was founded in 1980. The Committee's mission is to promote and raise funds for the perpetual care and improvement of the garden. In cooperation with the Normandale College Foundation and with Normandale College Staff, the Committee is charged to see that all construction and maintenance shall adhere to the original design concept of Takao Watanabe. We meet monthly on the third Mondays. Committee members are expected to attend the regular meetings and to serve on one or more of the subcommittees which include tours/weddings, festival, public relations, buildings and grounds, membership, and website communications. We've begun a Master Planning process and need more Committee members. We welcome a background related to: gardening, landscape architecture, Japanese gardening or Japanese culture, fundraising, finance, publicity, horticulture, local government, land use planning, education, communication, wetland management, law or areas related to our mission.We also welcome volunteers if committing to monthly meetings isn't feasible: event hosts, tour guides (May to October), fall or spring teachers, and Festival volunteers! Would you recommend NORMANDALE COMMUNITY COLLEGE FOUNDATION--Japanese Garden?